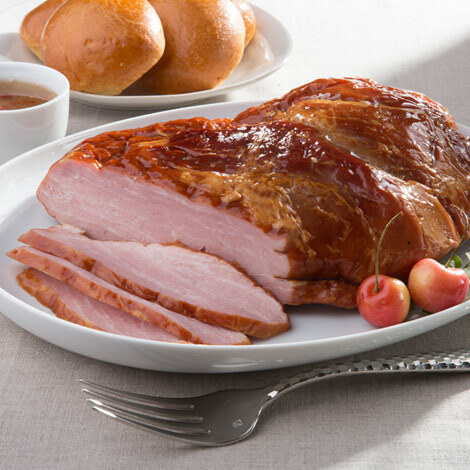 The newest star in our Amana Ham lineup! 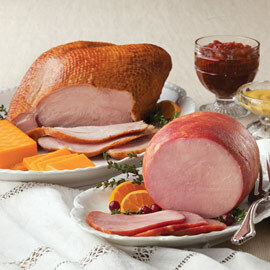 Enjoy the flavor and texture of our bone-in ham without having to carve around a bone. This Amana 4.5 - 5.5 lb. Hickory-Smoked Boneless Ham makes perfect brisket-sized slices and will be a sure home run when served at your next brunch buffet or for an easy meal when your family is craving ham. We'll include a FREE 8 oz. jar of our Horseradish Jelly for glazing this ham to perfection. Servings: This delicious Ham Filet will serve approximately 3-4 people per pound. This is the perfect size for a party buffet. Or for grilling, glazing and serving at a family barbecue. We had it on our Christmas buffet table surrounded by cheeses and other appetizers, alongside a nice basket of rolls and an assortment of mustards. There wasn't a bite when the party was over! It was that popular with my guests! And very very easy to prepare as it's quick to bake and there is no bone. I glazed it and horseradish jelly, heated as directed and served - perfection - first try. Best we've tasted in a long time. We will be using your company again. My wife and I love this ham. Perfect size for the two of us. As always the ham comes to the house perfectly packaged. Keep up the great products and service. The outside of this ham was tough. I wasn't expecting that from reading the reviews on this product. The taste was somewhat less than what I was expecting as well. Probably will not purchase again. Amana Response: Ron, We are so sorry to hear this! Please call us at 800-373-6328 so we can talk about this further and can make it right. This has been one of our most flavorful, tender and most loved hams the last couple of years, so would love to talk with you about your particular ham order. Got the sm ham filet. Best ham ever! Customer service is excellent. Delivered in a timely manner. Ham is just wonderful full of flavor. Will reorder. This was probably one of the best hams I have ever had! I have been eating Amana hams for years, we even drive/stay in the Colonies. But this ham is the best they ever had. Also try the Pepper bacon with your BLT's. 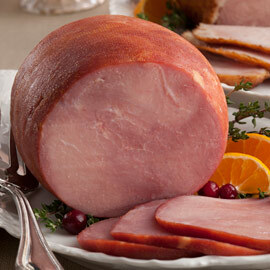 I recently ordered the new Amana Ham Filet and I just love it. It's lean and flavorful and makes great sandwiches with the horseradish jelly! I'll definitely get this again. Excellent. We've ordered about a half dozen or more. The best ham we've ever tasted. Our friends agree also. Great tasting ham filet. Pairs well with green beans and potatoes or with sauerkraut and potatoes. Great on rye bread if the ham is sliced thin. This was some very good tasting ham. shared it with my family and they really enjoyed it. The best ham I have EVER had! Where has it been all my life? This ham filet is perfect. 4 - 5 lbs. is going a long way to ensuring the holiday-new year week will be one to remember. There's only two of us and we're enjoying many sandwiches, dinners, breakfasts and snacks! We will order other meats from Amana based upon this, our first order. One recommendation is that you advise us with tracking info during the process. The size of the fillet was perfect for carving into thin slices for sandwiches. Amanda Hams have a flavor and juiciness like none other. Great for entertaining! Easy preparation, feeds a crowd, slices easily for serving, good quality for value price, and great flavor (plus don't forget to glaze with the horseradish sauce)! As my 4-year old son says "so good it doesn't need ketchup!" All the delicious bone-in flavor without having to mess with cutting around the bone - a task I have yet to master and now don't need to. Amana Response: Thank you! 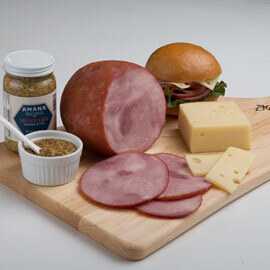 We are so glad you like our newest addition to the Amana Ham lineup! This Ham Filet is fully cooked and just needs to be re-heated to release it's own natural juices for optimal flavor and tenderness. Preheat your oven to 325°. Remove packaging and place on a rack in a shallow pan or roaster with a small amount of water. Cover with foil or lid. Bake approximately 12-14 minutes per pound, or until the internal temperature reaches 135°. Remove foil 3/4 the way through the cooking time so browning can occur. Basting it in it's own juices is recommended during the warming process. This ham is delicious all on it's own, but glazing is always an option. We recommend using our Horseradish Jelly for glazing, or on the side as a dipping sauce - delicious!